Halloween in Georgetown is what it is today because of Mike O’Harro. In this Part One of a Two Part Series Our Town host, Andy Ockershausen, learns the tricks of the trade and gets the inside scoop from the king and queen of DC nightlife themselves! Listen in to learn how Mike O’Harro and Linda Roth began opening restaurants and bars to make the DC night scene full of life and energy. In Part One of Our Town’s Two Part Series dedicated to Halloween and DC Nightlife, we are fortunate to have as our guest “the Disco King” and “Washington’s Hugh Hefner” Mike O’Harro. Mike grew up in Hollywood and served in the U.S. Navy when he came to the Washington, DC area in 1963. Andy Ockershausen reveals how Mike wasdiscontent with the social scene here in the DC area. So he got busy, and according to Les Shaver, he became “an officer-by-day and a party-planner-by-night” as he carried both top-secret letters and party invitations around town. O’Harro left the Navy and went into business with Jim Desmond to open his first singles bar, Gentlemen II. In 1975, he linked arms with Billy Martin to open Tramps in Washington D.C., one of America’s first and most successful discos. Big name celebs such as Elizabeth Taylor, Sylvester Stalone and famous soccer player, Pele, could be found hanging out at Tramps. It was at Tramps that the big Halloween event in Georgetown began. Mike O’Harro’s vision of a proper Halloween bash inspired customers at Tramps to spill out into the streets. This Halloween in Georgetown street celebration has become a tradition that still lives on today. In 1983, along with partner Jim Desmond, he opened the first Champions Sports Bar. According to Bonnie Jean Hammet, Mike was not at all the womanizer that some folks perceived he was, rather, he was a “great friend to women and a nice person to be around”. Mike is now in his mid-70s and prefers his privacy over today’s nightclub style. Our Town host Andy Ockershausen continues the interview with Mike O’Harro and Linda Roth in Part Two of this Two Part Series which will be released Thursday, October 27. Please stay tuned. We hope you enjoy listening Mike O’Harro discuss his perspectives of Our Town with host Andy Ockershausen. We hope you listen in on Thursday to Part Two with Our Town guest Linda Roth and invite you to listen to each new episode of Our Town as they roll out over the next several months. 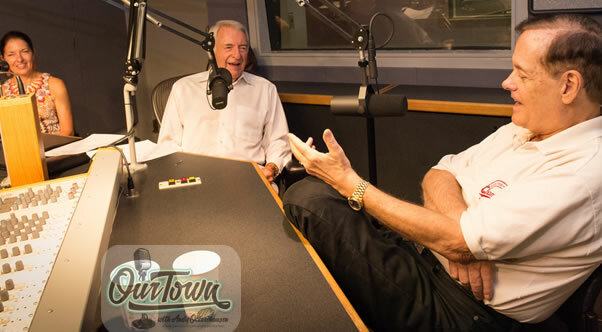 You can subscribe to the Our Town podcast on iTunes, Google Play, or if you complete the subscription form in the sidebar to the right you will be notified by email when the next episode appears here on the website.